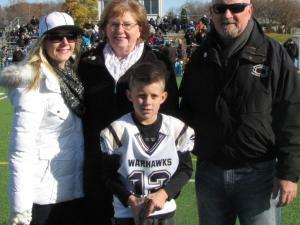 Congratulations to one of our Tyke Warhawks, Josh Depotie who was nominated by the Waterloo Wellington County Football Officials Association (WWCFOA) for the annual Harry Beeksma Memorial Bursary. Three years ago year ago, WWCFOA lost their hardest working minor football official, Harry Beeksma. To honour his memory they offer an annual bursary to be awarded to a Tyke player for exhibiting the attributes that Harry loved. These attributes included coachablity and being a team player. The executive committee agreed that Josh demonstrated those attributes very well. Josh will have his 2016 football registration paid for by the WWCFOA and was honoured at the WCSSAA Senior Championship Day, Saturday November 12.